A few days later, I follow an old lady through the winding streets of Lisbon, as she carries a large bundle on her head, wrapped in a woolen shawl. 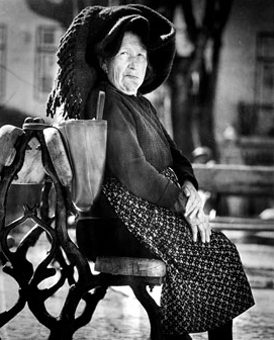 When she gets to the top of the hill, she plunks down on an iron bench in front of a cathedral, puts her packages on the seat beside her, and gives herself a time-out from her labors. Unlike the old man, it doesn’t strike me that she’s here everyday, rather that she takes the opportunity to rest from her effort. She chews on a wad of tobacco, and periodically spats into the street. A few minutes later, she surprises me by stepping onto a bus, leaving the bench empty for the next passerby.